Hand-rolled truffles can be finished in many ways. 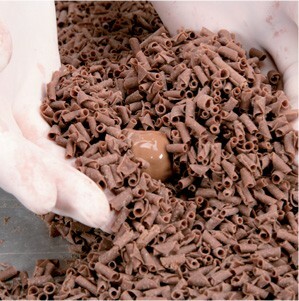 Finishing options include rolling the truffles in confectioners’ sugar mixed with fruit powder and corn starch; in ground nuts such as pistachios or coconut; or in chocolate curls, as demonstrated here. Fill a pastry bag with a ½-in/10-mm round tip with ganache. Pipe the ganache into spheres. Try to pipe the ganache into as spherical a shape as possible, to minimize the manual rolling time. This will reduce the likelihood of melting the ganache with body heat. Refrigerate the tray for 1 minute, then roll the ganache by hand if necessary to create nicely rounded balls. Let the ganache set until it becomes firm. Coat the rounded ganache in a fine coating of tempered couverture, and let sit until the couverture is completely set. Coat the truffles with a second coat of couverture, and immediately roll each truffle in chocolate curls or another topping before the couverture sets, so that the topping sticks to the surface. The truffles are coated twice in couverture before the topping is added in order to maintain a firm shape. If they were coated only once, rolling might cause the truffles to lose their round shape. – Pipe the ganache into spheres. – Give the truffles a second coating with the tempered couverture. – Immediately after the second coating, roll the truffles in couverture curls.